A global center for art, fashion, gastronomy and culture, and often hailed as the world’s most romantic city, Paris, France's capital is renowned for its broad monument-lined boulevards, breathtaking architecture, bustling bistros and fine dining restaurants, and classic café culture. 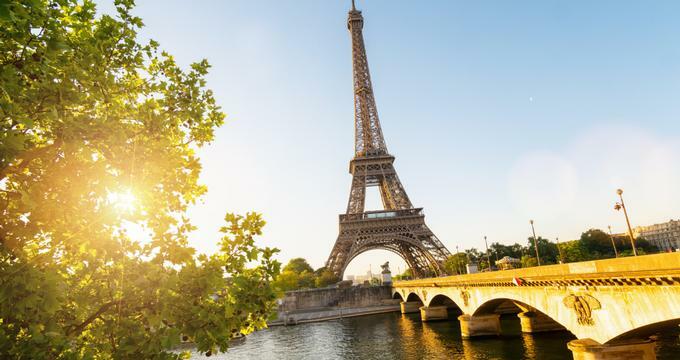 Crisscrossed by broad tree-lined avenues and the River Seine, the 19th-century cityscape is home to famous landmarks as the Eiffel Tower and the 12th-century, Gothic Notre-Dame cathedral, as well as the fashion-centric Rue du Faubourg Saint-Honoré, which is lined with designer boutiques. When it comes to luxurious places to stay, Paris doesn’t fail to deliver, and there are plenty of elegant hotels, charming guesthouses, quaint bed and breakfasts, and romantic retreats to rest your head. 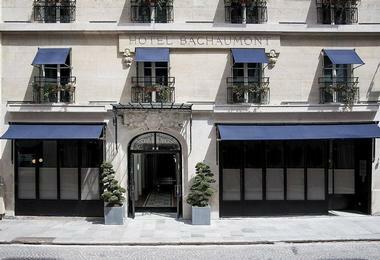 The Bachaumont Hotel is a sophisticated, art deco-inspired hotel in the 2nd arrondissement of Paris and just a short walk away from the famous Musée du Louvre. The stylish hotel features beautifully appointed and individually decorated rooms with period décor and antique furnishings, grand en suite bathrooms, wood and marble writing desks, and modern amenities such as flat-screen televisions, mini fridges, and complimentary wireless Internet. Luxury suites have bathrooms with free-standing soaking tubs, separate living rooms, wet bars, Nespresso machines, and private balconies with stunning city views. A gourmet breakfast buffet is served in an architecturally inspiring restaurant with a soaring glass ceiling, and a retro-chic bar hosts regular live music in the evenings. Located in the artistic Montmartre district, Hôtel Maison Souquet is set in an exclusive neoclassical Parisian townhouse and decorated in a Belle Époque theme. Just steps from Moulin Rouge in the trendy Pigalle area, the ultrachic hotel was designed by Jacques Garcia and features a blend of exotic and Second Empire–style furnishings, bespoke linens and designer toiletries, smart TVs and minibars, and complimentary wireless Internet. In-room massages, butlers, and 24-hour room service are available, and an elegant lounge boasts a fully stocked library, an ornate fireplace, and a stylish bar that serves light meals. Other amenities include an indoor swimming pool, a Turkish hammam and treatment room, and a pretty courtyard. Hôtel Maison Souquet is a short walk from the Moulin Rouge and the Musée du Louvre. Set on the Left Bank of the River Seine, the Hotel Montalembert Paris is an upscale hotel a short walk away from the Musée d'Orsay with refined accommodations and an elegant, upscale restaurant with outdoor terrace dining. The stylish hotel features individually decorated guest rooms with modern or traditional décor, iPod docks, flat-screen televisions, and complimentary wireless Internet, as well as luxury suites with plush furnishings, Nespresso machines, and Eiffel Tower views. Breakfast is available daily for an additional fee, and there are several meeting rooms, including a lounge with a fireplace for social and business gatherings. Set in the historic Le Marais district in a beautiful 17th-century building, the Boutique Hôtel de la Place des Vosges is an elegant hotel situated a block away from Place des Vosges and a short walk from Bastille metro station. The hotel features modern, understated guest rooms with contemporary décor and furnishings, wooden floors and exposed stone, en-suite bathrooms with showers, and modern amenities, including flat-screen televisions, mini fridges, and complimentary wireless Internet. Studios feature pullout beds for families with children and a two-bedroom loft apartment can sleep up to five people and boasts breathtaking views of the city from the sixth floor. Breakfast is available for an additional fee. Set on the Right Bank of the Seine in the 8th arrondissement, the Buddha-Bar Hotel Paris exudes the art of French living with stylish accommodations, gourmet cuisine, a full service spa, and a sophisticated nightclub with signature cocktails and a live DJ. 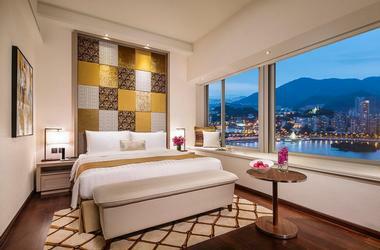 Designed to provide a unique tourism experience, the hotel features stylishly appointed guest rooms decorated in a fusion of Parisian and Asian styles and boast en-suite bathrooms with rain showers, wooden floors, Nespresso machines, flat-screen televisions, and complimentary wireless Internet. Upgraded suites have 18th-century-style decor and enjoy champagne receptions and welcome drinks. Luxury amenities include a full service spa and wellness area, a contemporary French restaurant with velvet armchairs and heated courtyard seating that serves gourmet cuisine, and a sleek nightclub with a resident DJ. 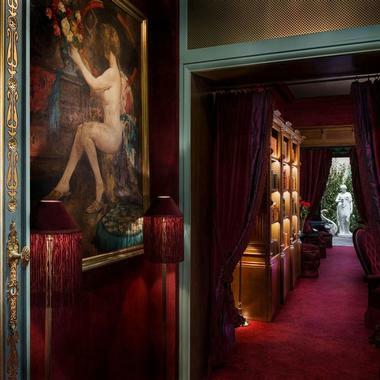 Buddha-Bar Hotel Paris is a short walk from the Musée du Louvre and the Eiffel Tower. 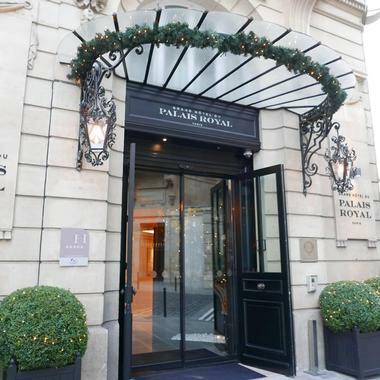 Set in a beautiful 18th-century building next to the Musée du Louvre museum and Tuileries Gardens, the Grand Hôtel du Palais Royal is a luxurious five-star retreat with a full-service spa, a contemporary French restaurant, and elegant accommodations. The posh hotel features stylishly appointed guest rooms with period décor, en-suite bathrooms with designer toiletries, private balconies with stunning city views, and modern amenities including minibars, flat-screen televisions, and complimentary wireless Internet. Suites have separate living rooms and Nespresso machines, and an opulent penthouse suite boasts a furnished terrace with spectacular panoramic views. Champagne and afternoon tea are served in the elegant lounge and bar, and a 24-hour exercise room and steam room are available for guests to use. Located in the street that was formerly the site of the west wing of the Abbey Saint Germain and housed in an 18th century building that once housed the Imprimerie Nationale state printing works, the Hôtel Bel Ami is an elegant hotel with a beautiful façade that bears witness to the industrial revolution and its conversion from a former printing works. A mere stone’s throw from the Place Saint-Germain-des-Prés, the Hôtel Bel Ami features contemporary rooms with flat-screen televisions, iPod docks, complimentary wireless Internet, and 24-hour room service. Upgraded suites have pull-out sofas and espresso machines, and a vibrant restaurant serves breakfast and weekend brunch. A trendy cocktail bar serves signature drinks, and a deluxe spa has two treatments rooms, a fully equipped exercise room, and a sauna. 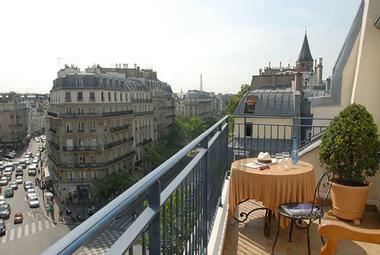 The Hôtel Bel Ami is a short walk from the Saint-Germain-des-Prés metro station and the Musée du Luxembourg. 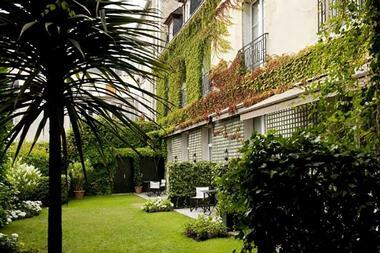 Set among the boutiques and galleries of the vibrant Marais district, the Hôtel Bourg Tibourg - Paris Marais is an eccentric, upscale boutique hotel close to the Cathédrale Notre Dame and the Musée du Louvre. The hotel features deluxe guest rooms, en-suite bathrooms with soaking tubs and designer toiletries, Bang & Olufsen flat-screen televisions with DVD players, minibars, and iPads. A stylishly appointed one-bedroom suite has a sitting room with an interconnecting bedroom, and a complimentary breakfast is served in the comfort of the guest rooms or in an elegant salon. 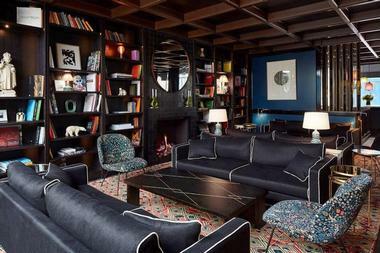 A lavish lounge boasts classic French literature and graphic novels for guests to enjoy. 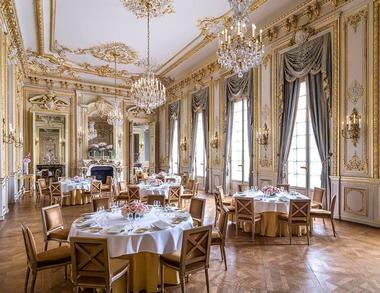 Based in a 17th-century townhouse, the Hôtel d'Aubusson Paris is a grand hotel with elegant public spaces, refined accommodations with modern amenities, and an all-day café with a grand piano that hosts regular jazz nights. The hotel features well-appointed guest rooms with period décor and antique furnishings, flat-screen televisions, iPod docking stations, minibars, and complimentary wireless Internet. Upgraded split-level rooms have spacious mezzanine sleeping areas, and luxury suites have elegant living spaces and espresso machines. A year-round patio is ideal for alfresco dining and drinks, and room service is available throughout the day. 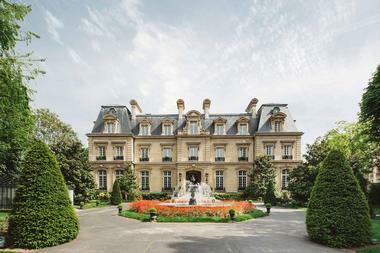 The Hôtel d'Aubusson Paris is a short walk from the Cathédrale Notre-Dame de Paris, the Musée du Louvre, and the Musée d'Orsay. 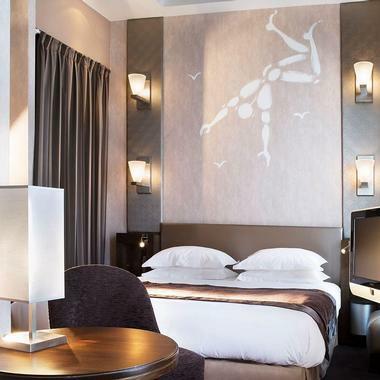 A short stroll from the Grands Boulevards metro station, the Sacré-Coeur Basilica and the Musée du Louvre, the Hôtel de NELL is a trendy hotel with sleek, minimalist accommodations, modern amenities, and a fashionable bistro, a bar and a wine cellar. The hotel features stylishly furnished guest rooms with en-suite bathrooms and rainfall showers or Japanese wood soaking tubs, Nespresso machines, flat-screen televisions, Bluetooth speakers, and complimentary wireless Internet, and a private suite has a balcony overlooking a pretty church square. A casual bistro serves classic French fare and an elegant bar, and wine cellar provides an extensive selection of fine wines from around the world. Room service is offered, and spa treatments are available for an additional fee. 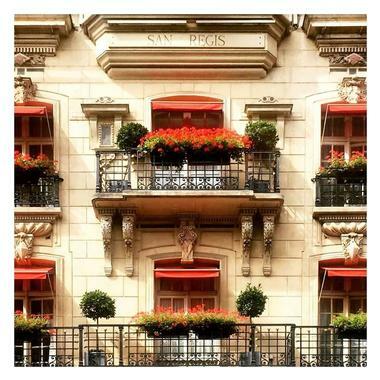 Located a short walk from the Musée Galliera and the Eiffel Tower, the Hotel de Sers is an upscale hotel with designer accommodations, a chic, understated bar and restaurant with terrace seating with serves haute cuisine, and a Turkish hammam. The hotel features well-appointed guest rooms with contemporary décor, flat-screen televisions with cable channels, iPads, complimentary wireless Internet, and balconies with Eiffel Tower views. Luxury suites have plush lounges, and private balconies with panoramic city vistas and an apartment offers two kitchens, en-suite bathrooms with circular soaking tubs, and two roof terraces with spectacular views. Deluxe amenities include a fully equipped exercise room, a Turkish hammam, and a range of spa treatments for an additional fee. Set across the road from the beautiful 19th-century building that housed the prestigious Académie Colarossi in the Rive Gauche area, the Hôtel des Academies et des Arts - Paris 6 is a stylish, art-focused with elegant accommodations, a refined tearoom and bar, and modern amenities. The hotel is a short walk from the 17th-century park of Le Jardin du Luxembourg and features individually decorated guest rooms and suites with sitting areas, flat-screen televisions, minibars, and complimentary wireless Internet. Whimsical paintings and sculptures adorn the hotel, guests can enjoy breakfast and spa treatments for an additional fee, and art tours can be arranged if required. Set in the vibrant Marais district and a short walk away from the Musée du Musée du Louvre and Le musée Carnavalet, the Hotel Emile is a chic hotel in the heart of Paris that offers a comfortable and relaxed retreat. The hotel features stylish guest rooms with minimalist décor, open-plan bathrooms with showers, double-glazed windows, and modern amenities such as flat-screen televisions, and complimentary wireless Internet. A luxury suite boasts breathtaking city views from a rooftop terrace, and complimentary breakfast is served in a bright dining room every morning. Located on a narrow Parisian street close to the Gare de l’Est Train Station, the Hotel Paradis Paris is a chic boutique hotel with stylish guest rooms, modern amenities, and a cozy guest lounge. The hotel is ideally situated for exploring the city with the artistic Montmartre district and the Galeries Lafayette a short walk away. The hotel features well-appointed guest rooms with en-suite bathrooms, pull-out sofas, flat-screen televisions, and complimentary wireless Internet, as well as a luxury suite on the top floor of the hotel with a sitting area, an espresso machine, and glorious city views. A continental breakfast is served each morning in the breakfast room, and a vending machine provides a range of drinks. A 24-hour reception desk has a safety deposit box and luggage storage, and there are free daily newspapers in the hotel lobby each day. 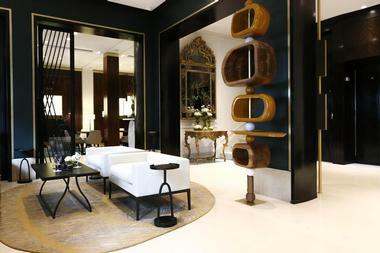 Located in 8th arrondissement close to the Arc de Triomphe de l'Étoile and the famous Avenue des Champs-Élysées, the Hôtel San Régis is an award-winning, luxury hotel that offers opulent accommodations, high-end amenities, and an elegant glass-roofed restaurant, bar, and lounge serving acclaimed French cuisine. Set in a beautiful building on the Rue Jean Goujon, the chic hotel features stylishly appointed and individually decorated guest rooms with period décor and antique furnishings, original artworks, and luxe fabrics, marble en-suite bathrooms with designer toiletries, pull-out sofas, flat-screen televisions, and complimentary wireless Internet. Suites have separate living rooms, dressing rooms, and stunning views of the Eiffel Tower, and laptops and DVD players are available upon request. An upmarket glass-roofed restaurant, bar, and lounge serve regional French cuisine and afternoon high tea overlooking a pretty courtyard garden. Set in a building with a beautiful Art Nouveau façade in the 1st arrondissement, La Clef Musée du Louvre Paris is a luxurious, all-suite hotel next to the Musée du Louvre art gallery and a short drive away from the Eiffel Tower. The hotel features stylish suites with spacious living areas, full kitchens with washers and dryers, flat-screen televisions and DVD players, and complimentary wireless Internet, as well as private balconies with beautiful views. A breakfast buffet is served in the hotel’s elegant dining room for an additional fee and guests have access to a cozy lounge and a fully equipped fitness room. 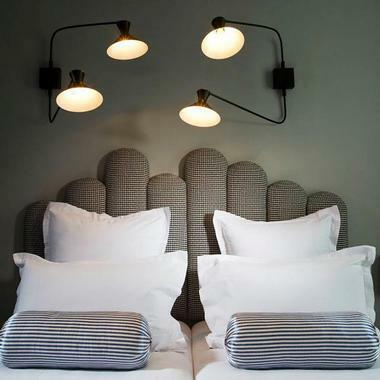 The La Maison Saint-Germain Boutique Hotel Paris 6 is a chic apartment hotel in the 6th arrondissement a short way from the Musée du Louvre, the Pont Neuf and the Musée d'Orsay. Set on the Boulevard Saint-Germain, the hotel features elegant studios and apartments with living rooms, kitchenettes or full kitchens, en-suite bathrooms with showers, and complimentary wireless Internet. A duplex apartment and separate three-story house are also available for larger groups of friends and families and have private terraces with spectacular city views. 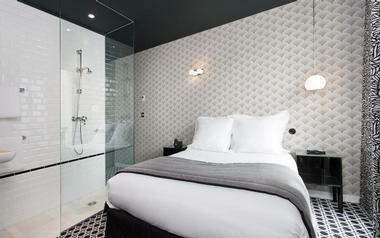 Complimentary services at the Maison Saint Germain include daily cleaning and an airport shuttle. Set on the famous fashion-centric and designer boutique-lined Rue du Faubourg Saint-Honoré, Le Bristol Paris is an iconic regal hotel dating back to 1925 that offers a rich Parisian experience. Home to two highly acclaimed, award-winning restaurants, a ritzy bar, and a casual café with a terrace overlooking a beautiful garden, the hotel is one of the top spots in the city for fine French cuisine. Refined guest rooms have Louis XV and Louis XVI furniture, marble en-suite bathrooms with soaking tubs and showers, chandelier-laden living spaces, and original oak floors. Old World meets new with modern amenities such as in-room flat-screen televisions and complimentary wireless Internet, as well as a boutique spa, an indoor swimming pool with stunning city views, and a stylish rooftop terrace. Located on Place des Vosges in the 3rd arrondissement, Le Pavillon de la Reine is a luxury boutique hotel in the vibrant Marais district that offers stylish guest rooms and a full-service day spa. 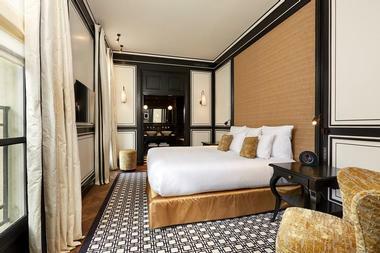 A short walk away from Paris's oldest square, the Place des Vosges, the sophisticated hotel is set in an elegant building and features warmly decorated guest rooms and suites with contemporary décor, mosaic-tiled bathrooms, minibars, flat-screen televisions, and complimentary wireless Internet. Suites have separate sitting areas and kitchenettes and can sleep up to five people. A refined bar and a lounge with a library are ideal places to relax with a drink, and a delicious breakfast buffet is served in the lobby or in-room every morning. Other amenities include a fully equipped fitness center, a Turkish hammam, Jacuzzi and a full-service spa, and loaner bikes for exploring the city. Set in the 1st arrondissement in the heart of Paris, Le Roch Hotel & Spa is an ultra-chic designer boutique hotel with stylish rooms and an acclaimed restaurant serving haute French cuisine. Designed by Sarah Lavoine, the hotel is a short walk away from the Tuileries Garden and the Musée du Louvre and features beautifully appointed guest rooms with contemporary décor, en-suite bathrooms and modern amenities such as tablets, flat-screen televisions, and coffeemakers. Suites have spacious living rooms with minibars, hammams, and furnished terraces with striking city views and room service is available throughout the day and night. An award-winning haute restaurant with floor-to-ceiling windows serves French cuisine, and a bar and lounge with a fireplace are perfect for relaxing with after-dinner drinks. Other amenities include a full-service day spa and hammam, an indoor swimming pool and fitness room. Designed by the renowned Philippe Starck, Le Royal Monceau is a luxe hotel with stylish accommodations and three acclaimed restaurants. Located on Avenue Hoche and close to the Arc de Triomphe and the Musée du Musée du Louvre, the hotel features bright, art-filled rooms with one-suite bathrooms, minibars, flat-screen televisions, and acoustic guitars, and PlayStation or Wii consoles are available on request. Luxury suites have spacious living rooms furnished with mid-20th-century décor and opulent Presidential Suites have added private lifts, and some offer home cinemas, fully equipped gyms, and full kitchens. Three award-winning restaurants serve a range of globally inspired cuisine, including Italian and Japanese, as well as two chic bars, a full service spa with an infinity swimming pool, a luxe cinema, and an art gallery. A beautiful dining terrace provides the opportunity for alfresco dining under the stars against a backdrop of spectacular city views. Located in the Saint-Germain-des-Prés district of Paris, the Millesime Hotel Paris is a chic, refined hotel with stylish accommodations, a beautiful courtyard garden, and 16th-century, vaulted wine cellar with stone walls. The modern hotel features well-appointed guest rooms with en-suite bathrooms, showers and designer toiletries, work desks and chairs, flat-screen televisions, minibars and complimentary wireless Internet. A luxury suite has a whirlpool tub, pull out sofas, and beautiful rooftop views of the city and a beautiful courtyard garden is the perfect place to relax. A continental breakfast is served every morning in the guest rooms or in the wine cellar, and a guest computer is available at the hotel reception. Set in a beautifully preserved 16th-century mansion, the Relais Christine is an elegant, upscale hotel with luxe accommodations, a full service spa and salon, and a posh lounge and bar that serves signature libations. Located a short walk away from the Cathédrale Notre-Dame and the Sainte-Chapelle, the hotel features deluxe guest rooms with en-suite bathrooms, flat-screen televisions, Bluetooth speakers, Nespresso machines, and private terraces with garden views. Split-level suites have sitting areas or lounges with pull-out sofas, and pretty private gardens and room service is available 24/7. The hotel also boasts a fully equipped fitness center with a Jacuzzi and serves a delicious continental breakfast every morning in the cozy dining room. Guests can rent bikes for exploring the city. Located a 20-minute walk from the Champs Elysées, the Saint-James Paris is an elegant 19th-century château-hotel with its own private garden. 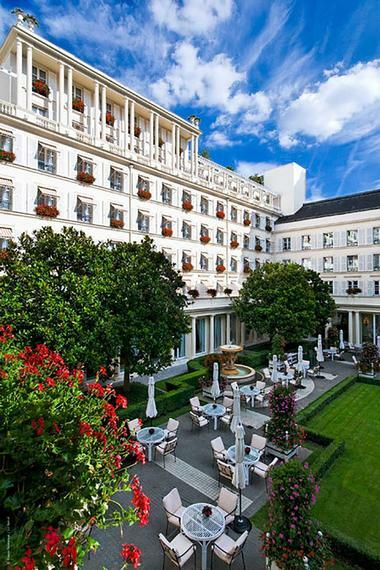 Surrounded by beautifully manicured gardens with balloon-shaped pavilions, the hotel is based in a grand Napoleon III building with chic accommodations, a boudoir-style spa, and a terraced restaurant with stunning views. Lavish guest rooms feature period décor and antique furnishings, swagged silk-and-velvet drapes, marble en-suite bathrooms with designer toiletries, and in-suite pianos. 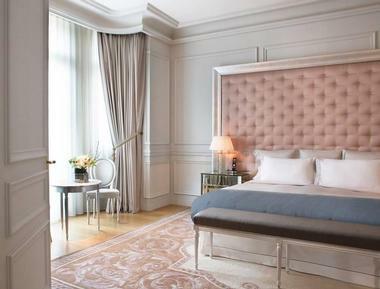 The elegant city-center château is located a stone’s throw from the Arc de Triomphe and Avenue Victor Hugo. Set in a former royal home along a pretty tree-lined boulevard in the 16th arrondissement, the Shangri-La Hotel is a ritzy hotel with an award-winning restaurant, a chic bar, and a full service day spa and salon. 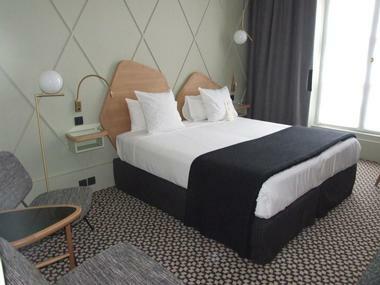 Located a short walk away from the Eiffel Tower and the Seine River, the elegant hotel features plush guest rooms with marble en-suite bathrooms and heated floors, coffeemakers, minibars, flat-screen televisions, and private balconies with beautiful views of the Eiffel Tower and the river. Lavish suites come with spacious living rooms and dining rooms, and complimentary wireless Internet is available throughout the hotel. Guests have a choice of three restaurants, and the use of an indoor swimming pool and fully equipped gym.